When it comes to accessories for the office drone, the name Kensington certainly does have a fair number of ‘hits’ in the past. For instance, the Kensington PowerLift back-up battery, dock and stand is something that will not only prop up your iPhone, but doubles up as a nifty power bank as well. Fast forward to today, and Kensington has introduced the CoolView Wellness Monitor Stand with Desk Fan, where this particular monitor stand will cost you $89.99 apiece. Touted to be the perfect monitor riser for modern office settings that are focused on employee wellness, the CoolView Wellness Monitor Stand boasts of an ergonomic monitor riser design as well as a low-noise, natural airflow cooling system. After all, things do get pretty hairy at the end of the money when you need to hand in all of those report during crunch time, so do expect to sweat some bit even in the midst of the air-condition at full blast. Kensington’s effort with the CoolView Wellness Monitor Stand is certainly worthy, where the steel base offers a stylish and durable support when it comes to external monitors as well as all-in-one PC’s that are up to 27″ in size. Through the elevation of the monitor to an optimal viewing height, the monitor stand’s ergonomic design will be able to promote a healthy posture while optimizing comfort levels for both the user’s neck and shoulders. 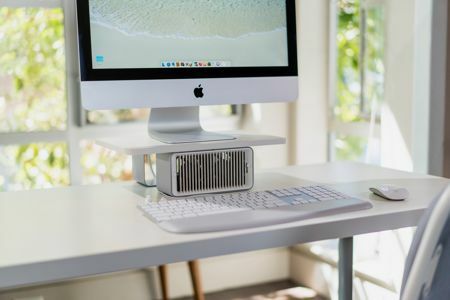 In addition, the built-in desk fan’s Dual-Fan Airflow System will be able to provide quiet and gentle airflow with the ability to select from two speeds. Sporting optimal indirect blowing angles as well as a low noise operation of less than <37dBA, this USB-powered fan will easily hook up to a USB port on a docking station, laptop, power bank or mobile power adapter. It is all the more flexible considering how the portable fan itself can be removed and function as a standalone desk fan in other spaces.